Studying climate dynamics phenomena, specifically related to turbulence, climate extremes, and large scale dynamics of atmospheres and oceans. Developping algorithms aimed at computing rare events in complex dynamical systems, like climate dynamics or turbulent flows, based on large deviation theory and statistical mechanics. Fundamental Aspects of Turbulent Flows in Climate Dynamics, International school coorganized with Tapio Schneider and Antoine Venaille, Les Houches Physics School, France, July 31 - August 25 2017. Extreme Events in the Earth and Planetary Sciences, International symposium, University of Warwick, UK, 04-08 July 2016. Statistical mechanics and computation of large deviation rate functions, International workshop, ENS de Lyon, June 2015. Theoretical Advances in Planetary Flows and Climate Dynamics, International conference, Les Houches Physics School, March 2-6, 2015. See the movie on Vimeo. This is an example of a seminar about large deviations in complex systems intended to researchers in statistical mechanics. Jeroen Wouters, a young post-doc researcher, has been awarded a two year AXA fellowship in order to work under my supervision. We will work on the computation of the probability of extreme events in climate models. He is just arrived at ENS-Lyon. I have been awarded a European Research Council grant: "Large Deviations and Non Equilibrium Phase Transitions for Turbulent Flows, Climate, and the Solar System". The aim of the research project is to use tools from statistical mechanics (large deviation theory, algorithms to compute rare events) in order to compute rare events relevant for climate, and the solar system dynamics. June 2013: Lectures at the 5th Warsaw school of statistical physics (at Kazimierz). References and documents about climate physics. June 2013: Seminar in classes préparatoires. At "Lycée la Martinière", Lyon. Slides. 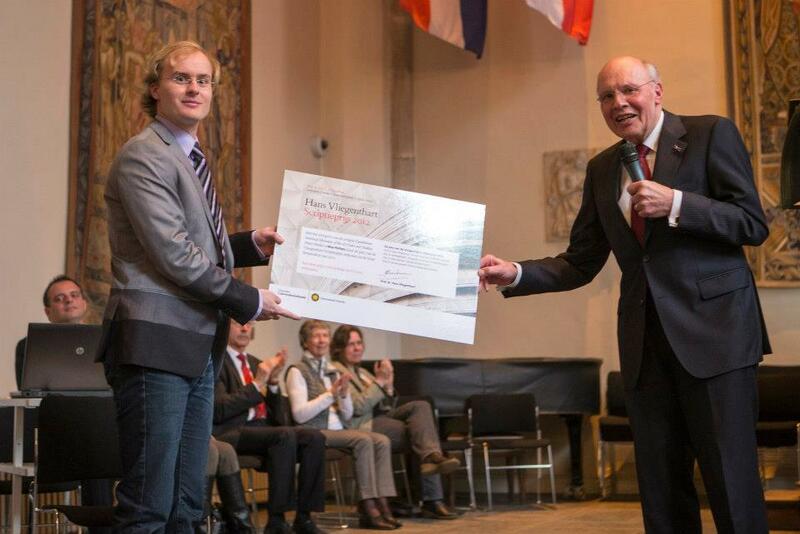 April 2013: Max Potters awarded for his Master thesis. 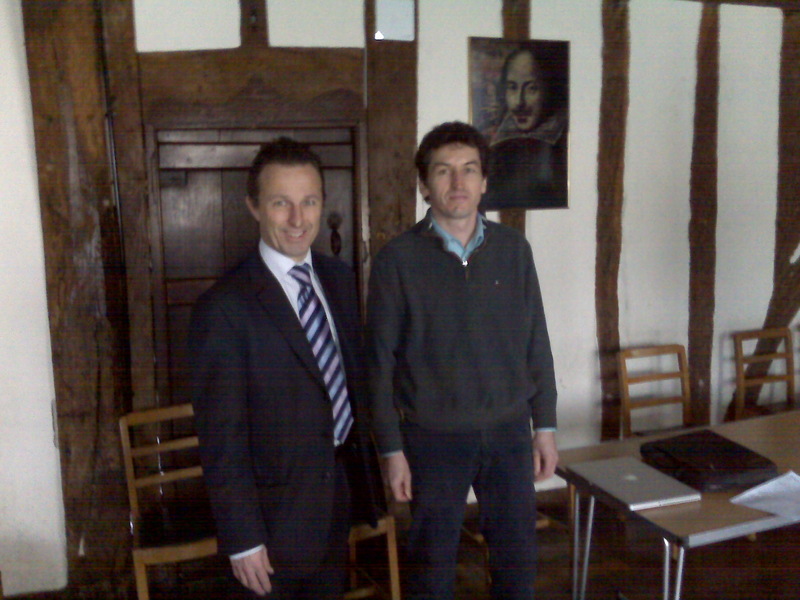 Max Potters, from Utrecht university, worked with me during one year in 2011 in order to prepare his Master thesis. He has been awarded a price for his work while in Lyon. His work deals with the statistical mechanics of the Shallow Water equations. It has been recognized as the best Master thesis of Utrecht university that year. More. March 2013: Conference "Vortex dynamics: formation, structure and function". 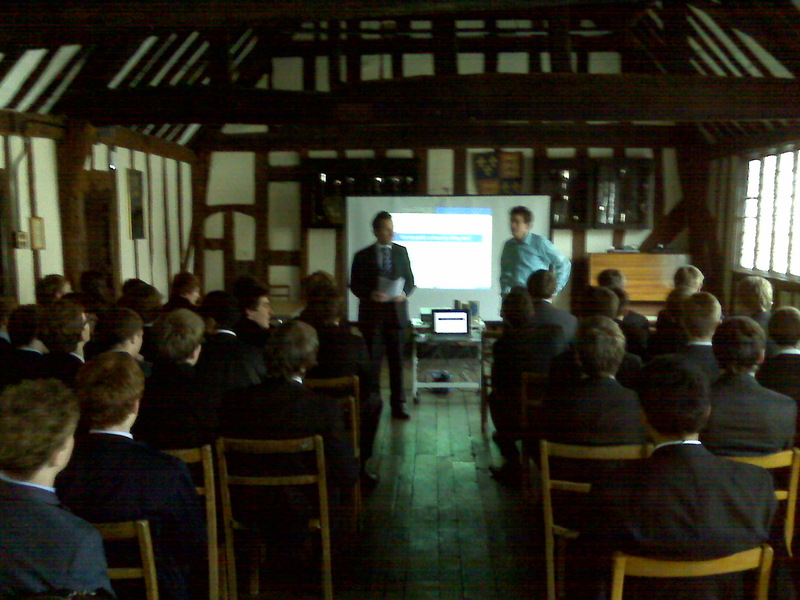 February 2013: Large audience conference in a UK High-School. 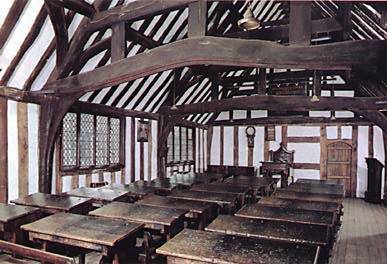 As I was fellow of the Institute of Advanced Studies of Warwick university (UK), at the mathematic department, I was asked to make a public lecture for high-school students at the grammar school of Stratfort-upon-Avon, the former school of Shakespeare. Slides. Can we predict cyclones by rolling dices ? January 2013: Conference "Statistical mechanics and climate". December 2012: Invited seminar at AGU meeting, San Francisco. I also advice you to look at the excellent seminar of Ray Pierre-Humbert on the history of the successes (and sometimes failures) of climate science to predict facts that have been observed a-posteriori. Pierre-Humbert's talk and slides. October 2012: Large audience seminar on climate, in Lyon: “Changements de climat : changements de société ?”, organisée par Pauline Lachapelle dans le cadre des recontres "Et si on en parlait"
September 2012: Book of Cedric Villani. Publication of the book of the field medal recipient Cédric Villani: Théorème vivant, Paris, Éd. Grasset et Fasquelle, 2012. Cedric refers in his book to some relations between his work and ours (please do not laugh when you will see my picture in his book). September 2012: Lectures of Peyresq's school published. During four years, I was organizing a school on nonlinear dynamics, Aux Rencontres de Peyresq, in the village of Peyresq. Together with J.A. Sepulchre and B. Audoly, we have edited a book: Peyresq lectures on non-linear dynamics, with some of the main lectures. It has just been published. June 2012: Organization of a conference on rare events in Lyon. COMPUTATION OF TRANSITION TRAJECTORIES AND RARE EVENTS IN NON-EQUILIBRIUM SYSTEMS (Applications in turbulence, chemistry, (bio)physics). This event has been organized by Frédéric Cérou, Marianne Corvellec, Arnaud Guyader, Hugo Touchette and myself, with the help of Samantha Barendson. 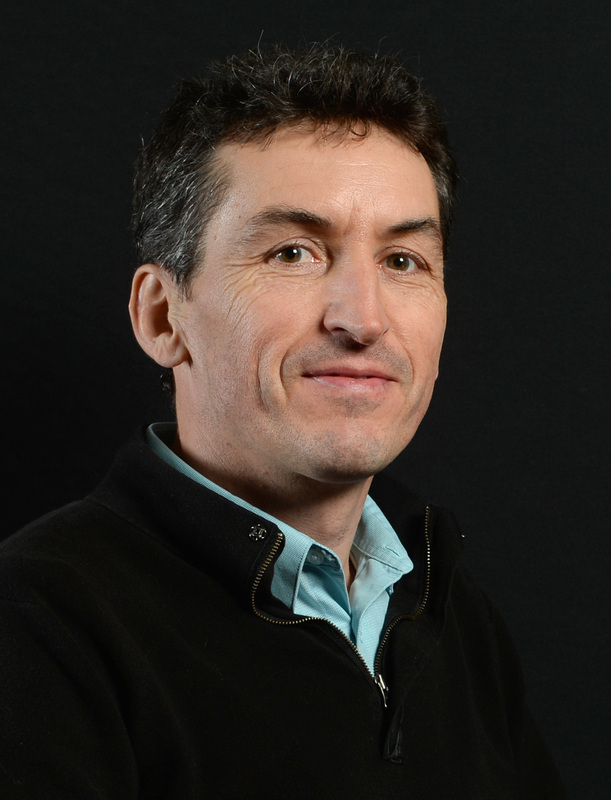 May 2012: Antoine at CNRS.